The Masonic Jewel. 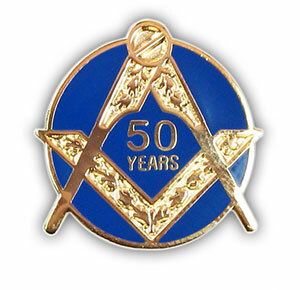 Issued to Masons after 50 years of faithful service. The Grand Lodge of Ireland recently approved the issue of 50-year jewels to Brethren who, sometime in their past, have transferred from another constitution, on the conditition that they had not broken their Masonic service when changing constitutions. St. Patrick applied for such a medal for a long-serving Brother, W.Bro. Kon Sharapoff who, in 1960, was intitiated into Freemasonry in an English lodge. Kon affiliated to Lodge St. Patrick in 1995 and served as our Master from 2002 to 2003. Kon and his wife Ev, however now live in Australia and our Secretary, V.W.Bro. Mel Darling, found himself with the vexing problem of how to get Kon’s jewel together with its certificate, to him in one piece. Fortunately Mel remembered that Kon’s son Paul, was still resident in Dunedin. Oddly enough, there aren’t too many Sharapoff’s in the Dunedin telephone directory, so our resourceful Secretary was able to phone him to discuss the issue. As luck as luck would have it, Paul was due to fly out to meet his father and mother within days but told Mel that it would have been nicer if a lodge member could have presented the award in person; nevertheless Paul would deliver it to his father. On arrival in Brisbane, Paul, who is not a Mason, searched the Internet and was able to contact a group of Queensland-based Freemasons. Amazingly they formed a deligation to visit Kon and present him with the jewel and certificate on behalf of Lodge St. Patrick, furthermore they had researched Kon’s Masonic history and really turned the presentation into a special Masonic event. Paul was delighted, and so was Kon and Ev. What a great example of Masonic friendship and universality at its best.